Behold the new iPhone 6S display. It's only a month or so until the time of year when Apple traditionally launches new iPhones, and the rumours and leaks are starting to gather pace. 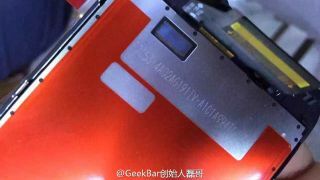 For your perusal this weekend we have some shots of the iPhone 6S display rolling off the production line, courtesy of GeekBar. It's not the most dramatic set of shots we've ever seen but it confirms that the iPhone 6S is going to look an awful lot like the iPhone 6. Jony Ive wouldn't put in all that work on the design of a phone only to rip up the blueprints a year later. There seem to be small and subtle differences to the display component when compared with last year's model - is Apple prepping an upgrade for the iPhone screen resolution, perhaps? In other weekend rumors of the rather unsurprising variety, there are new reports that Apple's suppliers are ramping up production of the Force Touch displays that will go inside the next batch of iPhones. Considering the pressure-sensitive technology has already appeared in the Apple Watch and the new MacBook, it would be a surprise if Apple didn't add it to the iPhone - if you get Force Touch in the iPhone 2015 features office sweepstake we reckon you could be quids in. If you want to know everything we think we know about the next set of iPhones, head to our dedicated hub page - it should give you a good idea of what Apple has in store this year.